Water is constantly on the move. It is evaporated from the oceans, lakes, streams, the surface of the land, and plants (transpiration) by solar energy (Figure 13.2). It is moved through the atmosphere by winds and condenses to form clouds of water droplets or ice crystals. It comes back down as rain or snow and then flows through streams, into lakes, and eventually back to the oceans. Water on the surface and in streams and lakes infiltrates the ground to become groundwater. Groundwater slowly moves through the rock and surficial materials. 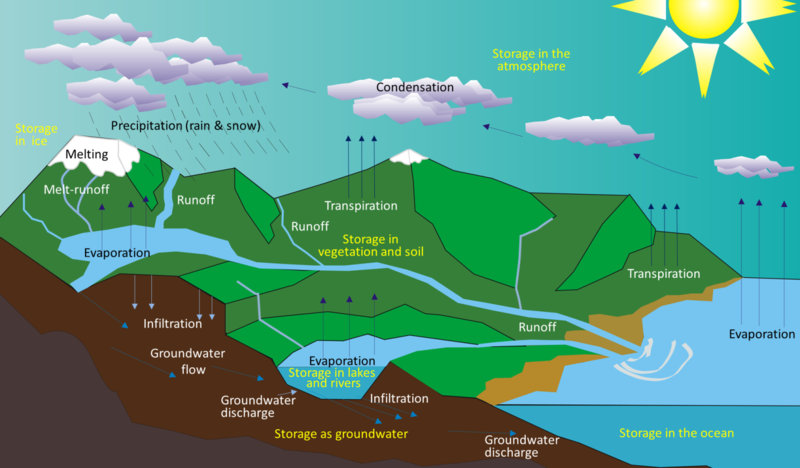 Some groundwater returns to other streams and lakes, and some goes directly back to the oceans. Even while it’s moving around, water is stored in various reservoirs. The largest, by far, is the oceans, accounting for 97% of the volume (Figure 13.3). Of course, that water is salty. The remaining 3% is fresh water. 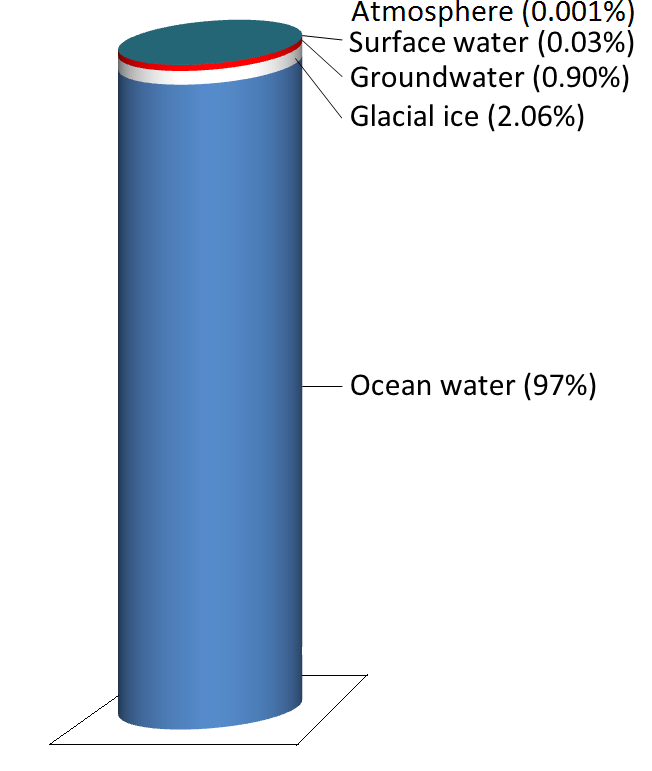 Two-thirds of our fresh water is stored in ice and one-third is stored in the ground. The remaining fresh water — about 0.03% of the total — is stored in lakes, streams, vegetation, and the atmosphere. 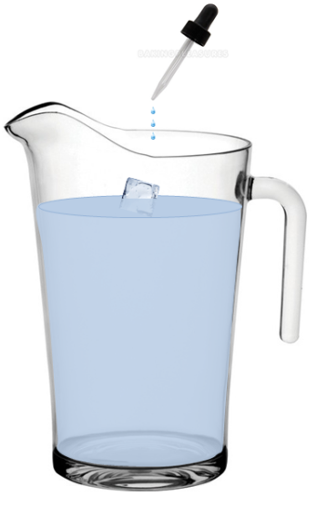 To put that in perspective, let’s think about putting all of Earth’s water into a 1 L jug (Figure 13.3b). We start by almost filling the jug with 970 ml of water and 34 g of salt. Then we add one regular-sized (~20 mL) ice cube (representing glacial ice) and two teaspoons (~10 mL) of groundwater. All of the water that we see around us in lakes and streams and up in the sky can be represented by adding three more drops from an eyedropper. Although the proportion of Earth’s water that is in the atmosphere is tiny, the actual volume is huge. At any given time, there is the equivalent of approximately 13,000 km3 of water in the air in the form of water vapour and water droplets in clouds. Water is evaporated from the oceans, vegetation, and lakes at a rate of 1,580 km3 per day, and just about exactly the same volume falls as rain and snow every day — over both the oceans and land. The precipitation that falls on land goes back to the ocean in the form of stream flow (117 km3/day) and groundwater flow (6 km3/day). Most of the rest of this chapter is about that 117 km3/day of streamflow. The average discharge of the Fraser River into the ocean is approximately 0.31 km3/day, or 0.26% of the world’s total. Exercise 13.1 How Long Does Water Stay in the Atmosphere? The residence time of a water molecule in the atmosphere (or any of the other reservoirs) can be estimated by dividing the amount that is there by the rate at which it is transferred in and out. For the atmosphere, we know that the reservoir size is 13,000 km3, and the rate of flux is 1,580 km3/day. If we divide 13,000 by 1,580, we get 8.22 days. This means that, on average, a molecule of water stays in the atmosphere for just over eight days. “Average” needs to be emphasized here because obviously some molecules stay in the air for only a few hours, while others may stay up there for weeks. The volume of the oceans is 1,338,000,000 km3 and the flux rate is approximately the same (1,580 km3/day). What is the average residence time of a water molecule in the ocean? 13.1 The Hydrological Cycle by Steven Earle is licensed under a Creative Commons Attribution 4.0 International License, except where otherwise noted.